Sensing the tides might turn against them, the House of Yoo conducts a mad dash to the House of Hong. With its defenses methodically eroded, will the heartquarters of House Hong survive the tempting onslaught? Best chap ever...Ahhhh :)!! THANK YOU GUYS, I LOVE YOU SO MUCH!! thank you so much ! you the best !! You know, I was SOOO waiting for this chapter, so thank you. I don't know that I 100% believe him myself, so I don't blame Sul. At the same time, he's jealous and nervous about losing her. So, I don't know... I am looking forward to seeing where this goes! Thanks a lot for the hard work, odd squad! Wow! Did not expect that to happen! :O I still don't understand Jung, but I'm really excited to see how things progress! Thank you guys for this!! Damn. After 68 chapters, the moment has finally arrived =03. I actually like the nonchalant way he asked about it. Now the real problems start, particularly Sul's relationship with In Ho(which gets better and better by the chapter). Thanks a lot for the chapters (^,^)! OH MY GOD WHAT A SURPRISE!!! aaaaaa finally that very moment. Thank you for translating this, keep up the good work! Btw, I almost missed it but I love this: "will the HEARTquarters of House Hong survive the tempting onslaught?" *does happy dance* My god thank you guys so much for translating this, doing the coding and text placement in addition to scanlating must have been really frustrating. >< This has been my favorite manhwa/manga since it first came out and I'm so glad that you guys decided to continue with it in spite of all the restrictions. You have all my support! awesome introduction spring is coming rofl! as rich as a Yoo. OMAYGAAAWD!!! THANK YOU SO MUCH!!! LOL. 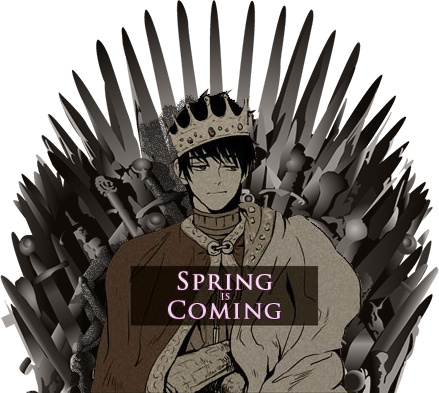 "Spring is coming"~ I see a lot of us are on The Game of Thrones bandwagon xD Thanks a lot!